Watch out Intel - NVIDIA's just broken out the big guns and this time they're not holding anything back. Coming out firing with both barrels blazing, the nForce 790i (Ultra) SLI promises to provide users with the ultimate platform for high-intensity, adrenaline-pounding gaming when it comes to combining NVIDIA multi-GPU 3D graphics and the power of today's most advanced Intel desktop microprocessors. Probably sounds a little over the top, but this time we reckon an nForce chipset for the Intel platform will live up to the hype. Aiming to steal as much attention as possible from the ongoing coverage of the many looming product releases based on Intel's upcoming X48 Express chipset, 790i makes no apologies for what it is: one of the fastest gaming platforms we have ever tested. In the past, less than impressive processor and memory overclocking capabilities - especially when running data-hungry quad-core CPUs - made it difficult to recommend an NVIDIA-based system to anyone other than those looking for the absolute maximum in gaming performance. After spending sometime with the nForce 790i Ultra SLI motherboards from ASUS and EVGA, we're not so sure we can say that anymore. A familiar color combination makes a comeback with NVIDIA's latest offering. EVGA's mean n' green NVIDIA nForce 790i Ultra SLI promises to take your gaming experience to a whole new level. Much like we have seen in the past, the initial NVIDIA offerings will consist of near immediate, worldwide product availability from the usual suspects - EVGA and XFX - as well as a few non-reference designs from vendors such ASUS, DFI, Gigabyte and MSI. For instance, we have the ASUS Striker II Extreme, which fortunately landed in our hands a little earlier this month allowing us additional time to test this platform. Squarely targeted at the serious gamer and extreme benchmarking enthusiast looking to squeeze every last ounce of 3D performance from their systems, motherboards based on 790i are the next big step in NVIDIA's quest for absolute dominance in the discrete graphics marketplace. NVIDIA's nForce 790i Ultra SLI specifications are shown here. The 790i SLI block diagram is strikingly similar; the only difference is a reference to JEDEC 1333MHz memory support and not the DDR3-2000 overclock capability highlighted above. The SPP contains bus control logic required to interface with the Central Processing Unit (CPU) via Intel's now well-aged Front Side Bus (FSB) in addition to a single, scalable HyperTransport Technology (HTT) link - licensed for use from AMD - which interfaces with the MCP. 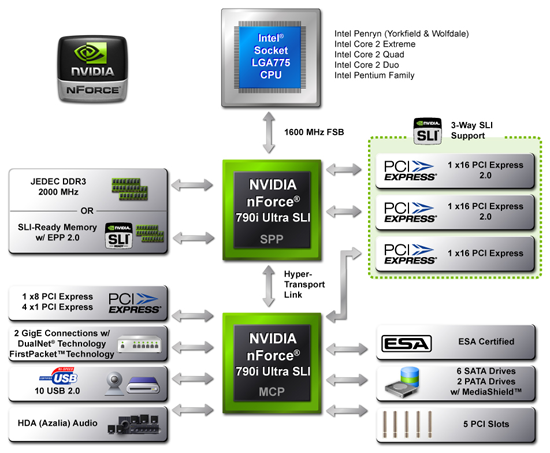 One of the major changes over the 780i SLI MCP is the integration of NVIDIA's newly-designed DDR3 memory controller capable of addressing up to 8GB of unregistered, non-ECC DDR3 memory. Add to this the incorporation of complete PCI Express (PCIe) 2.0 bus support and we can see that 790i is more than just a simple upgrade from 780i. Those looking to swap their current board for one featuring the 790i should find more than enough reason to consider the change. In order to retain their platform's competitive edge, NVIDIA has pulled out all the stops. They provide the required next-generation 45nm Intel LGA775 dual-core and quad-core CPU compatibility with official FSB 1600 support. Beyond that, we get DDR3 with EPP2 and two x16 PCIe 2.0 slots along with a third providing an additional full x16 PCIe 1.x link for second-generation tri-SLI graphics acceleration. Quad-SLI (using two GeForce 9800 GX2 cards) is also supported. Finally, the platform provides a tight integration of on-the-fly system control and monitoring courtesy of the Enthusiast System Architecture (ESA). We will be taking an in-depth look at the 790i based ASUS Striker II Extreme shortly and providing a full benchmark test suite with comparisons to other NVIDIA chipsets. As for today, let's take a closer look at what the new nForce 790i platform has in store for the serious gamer and overclocker - besides the cost of a new motherboard and a kit of expensive DDR3 performance memory. It's pretty sad how motherboard prices have ballooned in the past 2 years. 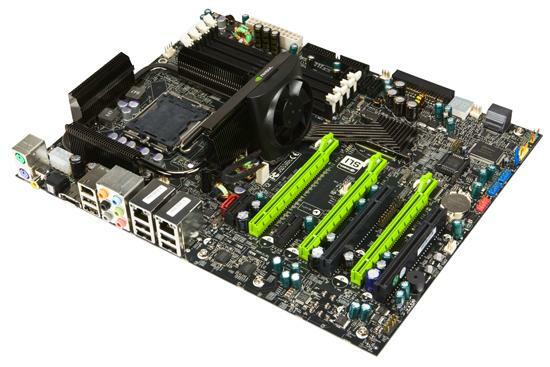 You used to pay $200 tops for a motherboard. Now we're getting models routinely at $250, $350, and now even $350. nVidia is of course trying to milk the heat seekers and first adopters, who will pay anything for a few micro fps more. But prices like this will mean that the whole series will sell a few thousand boards worldwide. And manufacturers will be burned (those that got on board to start with, not too many btw). I think nVidia is in the rope when it comes to the mobo business and it's starting to show. Products are problematic, late, overpriced and offer very little benefit to the majority of users aren't going to sell very well. I don't see this day happening anytime soon, hence I see the future of nvidia mobo chipset business as quite bleak. Okay, perhaps I'm just far enough out of the loop now to have missed out on the part where anyone bothers benching anything at medium quality when the products being compared don't differ on supported capabilities (a new pixel shader implementation, for example) which would be evident only when the game's cranked up all the way. Maybe for the sake of this particularly evil app it makes sense to even out test methodology by paring things out to Medium so bigger charts can be compiled in future without totally excluding less-capable hardware. Maybe. What I really don't understand is why we have independent resolution setups; testing for scaling (which in Crysis' case seems to be, obtusely, limited by the software much more than the hardware) rather than testing a more meaningful component-integration/observed-capability hypothesis. This is a motherboard we're testing (at least that's what EVGA would say if you asked) and it really hoses things up when you have to look at not only so many combinations of vastly different components and setups, but try also to divine meaning from this wild-hair test of resolution scaling thrown in the mix. $350-$400 just for a mobo!?!?!? are they on crack?!!?!? this is the most ridiculous thing i've ever heard since 1000wt psus. c'mon for the love of god, i bought my top of the line DFI expert for $180 a few months after release, what could possible justify $350-$400 for a mobo? I do understand that folks who will purchase a board based on 790i has SLI as a priority, but AT as of late tends to get marveled at advancing technology at the cost of basic functionality of such. How come all the relevant features are not tested for normal usage? How about Blu-Ray playback, whether the ROM is SATA or PATA? Is there any issue? The review mentions that when 3-way SLI is employed the other PCIe slots render useless. That's fine but how about when one or two video cards are used? In that case all PCIe slots function normally? Memory overclocking is nice and all that, but is the board handling DIMMs of various flavors without a trouble? Do the board handle 4 sticks of DIMM as well as it does 2? How about 2GB sticks? Well, one could argue that this is a moot point since DDR3 is expensive but then the whole thing is. I think it is appropriate since the review went on in length to detail the technical aspects of DIMM slots as well as the new memory controller. And there is the issue of power regulation. Better power delivery for overclocking is nice, but only if the board has mastered the basics. Are the fan headers working as they should, be it from a normal boot or wake-up from sleep? All the power-related features (S1/S3/EIST, etc.) that have been problematic on NV chipsets, especially under SLI - are they fixed? Talking about the fan, there is no mention of thermal characteristics of the chipset and also lacking is how loud/efficient the default fan is. (as well as RPM control) NV chipsets are infamous and I don't think the reviewer isn't aware of this. So it only leaves readers an impression that the review chose not to mention it. Also missing is the chipset's power consumption figure, network performance, compatibility with various add-in cards.. The list goes on and on and on. The chipset having the same south bridge from 680i/780i can't be an excuse. That south bridge lived through even more chipsets as we understand. From this review, users can hardly draw a conclusion on the performance of the chipset, let alone everything else. It'd make a interesting introduction on a new tech, but at the same time a misleading introduction on an upcoming product to actual users. (I thought this was a 'Review', not a 'Study'. If I'm mistaken please let me know.) This has been a trend in AT motherboard review as of late and I for one am somewhat disappointed because I cannot seem to obtain the information that's meaningful for actual usage. Working together with hardware manufacturer is important, but end-user perspective should be the priority No. 1, IMHO. I guess you deserve your money back Lopri, anyone would think it costs you money to click the mouse button and come over to read somebodies review. NOT! It's essentially a free site for us readers.. Oh yeah, I know it pays the site for us to click, but you just sound like someone who is eternally ungrateful for anything other than what you do yourself. I'm another that agrees with Lopri.